Spring has finally arrived and after the long, cold winter we experienced here in New Jersey, we couldn’t be more excited for the warm weather ahead. The first task on your spring cleaning to-do list is probably to freshen up the inside of your home, opening the windows and allowing some crisp spring air in. And the second task: Getting outside and getting your yard in shape again. From cleaning up branches to mowing the lawn and setting up patio furniture, there is plenty to do, making it easy to forget about cleaning out your gutters. An important task to complete, checking your gutters for dirt, debris and damage can ensure that your home doesn’t suffer from any water damage during the rainy spring months. Clogged gutters can cause water to back up and spill over the tops of your gutters, causing water damage to the fascia board, rafters and more. It can be difficult to tell how much debris has built up in your gutters over the winter season, and without getting up on a ladder to check you can’t be sure if your gutters need cleaning or not. This season, we recommend checking early to prevent any damage from occurring. You don’t want a leaky gutter to damage your foundation or a clogged one to hard the roof. 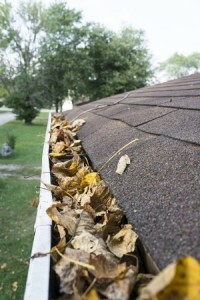 Tired of having to check your gutters every season or worried about your aging parents keeping theirs clean? 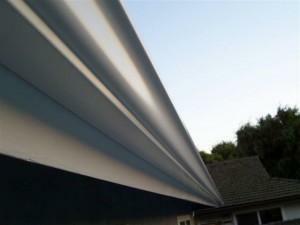 Gutter guards can provide a solution to your worries. Used to keep sticks, leaves and other debris out of your gutters, gutter guards can help to make your annual and semiannual cleaning easier for years to come. To learn more about these protective covers or to discuss the installation of new, high-quality gutters this spring, visit Bell Seamless Gutters online or give us a call at 1-800-597-1616. If your gutters are filled with debris this spring, don’t forget to follow our safety tips while you clean them out! Whether you are cleaning out gutters clogged with leaves and twigs or removing heavy icicles that can warp gutters and prevent proper damage, it is important to do so safely. 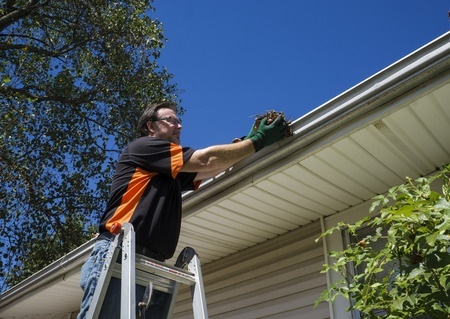 Slips and falls are an unfortunate possibility, which is why it is necessary to educate yourself on how to properly clean out your gutters before heading out to do the job. Use proper safety techniques when putting up your ladder and work with a partner to ensure that help is there in case of an accident. Follow these words of advice and you will be able to clear your gutters quickly and safely this season! Using your ladder properly is an easy way to prevent injury while cleaning out your gutters. A sturdy ladder will make cleaning easier and will prevent you from getting hurt on the job. Before getting on your ladder, check to make sure it is stabilized, on a flat surface with no loose parts. If you are using a step ladder, like many do for cleaning first story gutters, be sure that the arms are fully extended and hinges are locked in place. We recommend having someone steady it for you while you are working, always moving it before you have to extend your reach too far. While getting up and down the ladder repeatedly may seem like an annoyance, it will prevent you from slipping and falling. Another key component to ladder safety is wearing proper clothing. When working on any project outside, it is important to wear close-toed, rubber-soled shoes. Especially important if you have to climb onto your roof while cleaning, rubber-soles have the best grip, helping to prevent falls. You should also wear long sleeves, thick gloves and goggles while cleaning your gutters to prevent dirt and debris from scraping up your skin and getting into your eyes. From animal feces to rotting leaves, there are a lot of gross things that can be in your gutters, which is why we recommend covering your hands and arms to keep them clean and scratch-free. Another great way to stay safe while cleaning your gutters is to invest in Gutter Guards. By preventing debris from getting into your gutters, you will rarely have to get up on a ladder to perform cleaning, preventing the possibility of an accident from ever happening. To have Gutter Guards or new gutters installing on your Northern or Central New Jersey home, contact Bell Seamless Gutters at 1-800-597-1616 today! In many areas of the country, the spring season can bring a lot of rain with it; and our gutters will get a lot of use during this time of year. Most homeowners know that clean gutters are gutters that work. If they are dirty and clogged, they will be of no use when the rain showers start flowing through. Here are some valuable tips for maintenance and cleaning, to keep your gutters in great shape for the spring and summer weather. By using a few prevention methods, you can avoid the problem of clogged and dirty gutters, and save yourself a lot of cleaning time this spring. Mesh and screens: Plastic and metal screens with holes or slits in them, are good for allowing the rain to pass through, but help to block solid debris. Be careful with screens that have slits instead of holes, they can sometimes also keep water from passing through. If using mesh, or some form of stainless steel netting, installed flat or angled, it can act as a good strainer for the gutter. Solid covers: Molded plastic covers will allow a big enough space for rain and water to flow through, and any solid debris will normally bounce off of the gutter cover and fall to the ground, to be retrieved later. If your gutters are already clogged, here are some tips to clean them and restore the gutters to their usefulness. 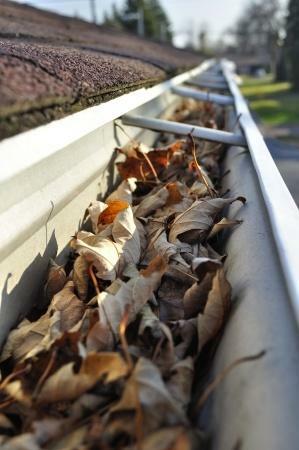 Always inspect your gutters regularly to see if they are clogged and dirty. If they are, use a hose to flush out the gutters and downspouts. Check to see if gutters are unclogged, by using a garden hose to run water through, and see if it flows through easily. Make sure that there are no areas of “pooling” in your gutters. Pooling means that there may be sagging areas or areas that are sloping. If you find any leaks, they need to be repaired immediately. Notice if there is any water spilling over the edges of the gutter. This means that there is debris jammed in a certain area of the gutter. If this happens, thoroughly clean gutters and downspouts until water runs effortlessly through. Then install a protective cover if needed. Inspect downspouts to be sure that they are securely connected to the gutters. Downspouts should be extended enough to move the rain and water, at least 3 feet away from the foundation of the home. Rain or water that flows to the ground, any closer to the home’s foundation, can cause serious damage.